Miss Berry thanks Dr. Clayton for letting her know about someone who might be willing to help Berry and for his help in the "Durbrow matter". 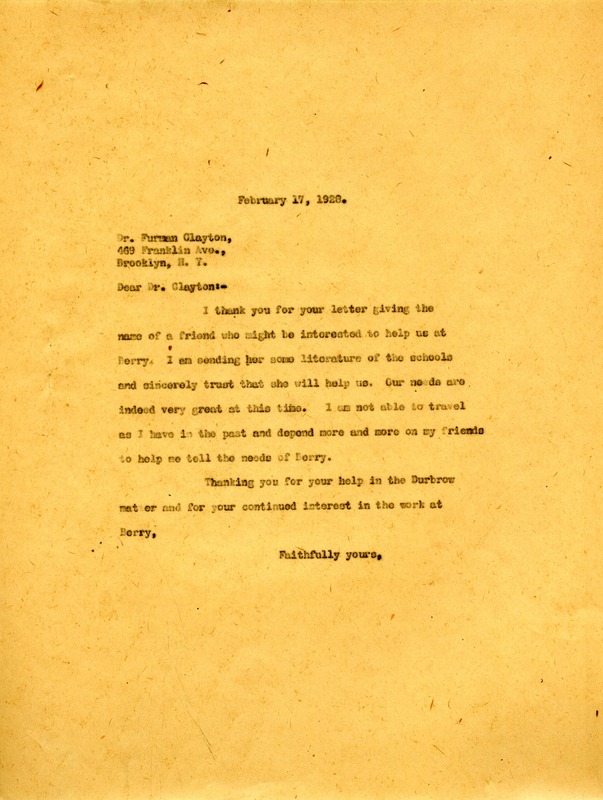 Miss Martha Berry, “Letter to Dr. Furman Clayton from Martha Berry.” Martha Berry Digital Archive. Eds. Schlitz, Stephanie A., Sherre Harrington, Meg Ratliff, Rachel Renaud, et al. Mount Berry: Berry College, 2012. accessed April 22, 2019, https://mbda.berry.edu/items/show/7018.